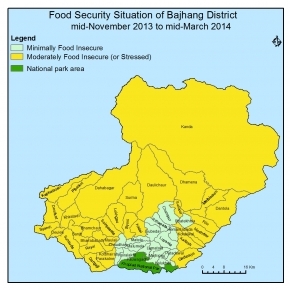 All (47) VDCs of the district are Minimally Food Insecure (phase I). · Income from sale of Yarshagumba worth 65 crore 31 lakhs 20 thousands rupees and 46 lakhs 56 thousands rupees income through vegetable sale. · Sufficient household food stock for >4 months due to normal harvest of paddy and maize respectively with in increment of 15% of paddy but 6% decreased of Maize. · HHs level food stock sufficient for 4 months. · Summer crops are completely harvested. · Rice purchased from local market due to good purchasing capacity. · Market stock sufficient for 1-2 months. · Market price of main food items increased by 10-15% compare to last year. · Main food items Rice, wheat flour, potato, pulse, mustard oil, soybean oil and chicken meat. · Wage opportunity: Agriculture and development works. · 16 VDCs declared ODF out of total 47. · 76% HHs accessing safe drinking water.